If you know me, even through my writing or attending a workshop or collaborating on a project, you know that I encourage (sometimes even provoke) people to think big. Corporate sponsorship is one of those marketing vehicles where thinking big is easy and the best way to go. The problem is most people don't. Here's a simple tool to help you test your ideas for bigness. 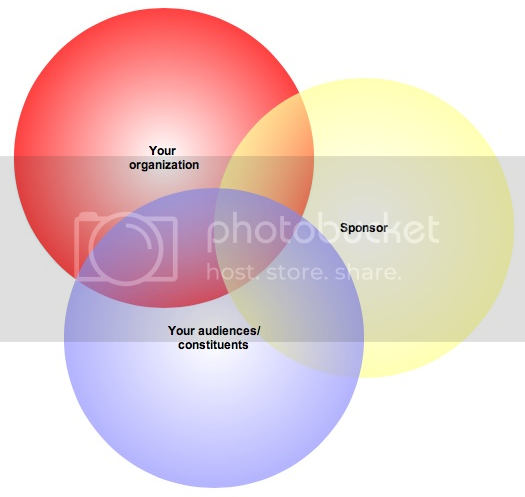 Considering this simple Venn diagram, ask yourself how your ideas work to advance the goals or needs of each stakeholder on this diagram. What's the storyline for each stakeholder? Are your ideas exciting from this stakeholder's vantage? If your idea isn't over-the-top awesome for each one, head back to the drawing board.